These are the secrets and hidden locations I’ve found so far, plus the contributions by the commenters: Livae, Larsa, Riun and Tabathine. Thanks to all of you! I’ve also added the discoveries made by the bloggers/podcasters Syrco (Syrco Owl) and Skolnick (Warcraft Less Traveled). Under the giant torrent in Darkshore, ther’s a hidden location. If you’ve been there, you know that it would look like a suicide attempt to jump in, but that is exactly what you should do…not suicide.. only the jumping. Bonus info: You won’t die! Instead it triggers a small cinematic, where you get to watch yourself dissapear into the eye of the storm, whereafter you fall into an underground cave. Here you meet an npc which conviniently can teleport you back up, no strings attached, but this is not were the easter egg is buried. By following a ramp going upwards you eventually meet the ghost of Telarius Voidstrider. As the picture shows, he is indeed hostile and will say the following: “The shadows will consume you. You are not prepared to face the void.”. Very reminiscent of Illidan Stormrage’s tagline. For Alliance players he drops a quest item: his writings containing certain secrets on the path to becoming a Demon Hunter. If you’re horde, he will not drop a quest item thus you can’t get the achievement, Tabathine reports in the comments, but he will still attack you. You need to be level 10 to take the quest, but sadly it doesn’t have an epic follow-up that allows you to start the transformation of becoming a demon hunter yourself – what a let down! Instead you get an achievement for completing it when you trustfully hand it in at Lor’danel. I found this one by accidentally running through a gate and into this tiny hidden garden. Before you get excited about a secret place inside Stormwind itself, I should say there’s practically nothing in there, except for a table with some big gems on it. Maybe there is a quest leading to it, but I havn’t been able to track any down. So perhaps this is the new but less flashy Cutthroat Alley? I found this place by exploring Twilight Highlands myself and as far as I know, there are no quests leading you to this place. I have not seen graveyards like these before, which is why I’m adding them. You can only reach this place by flying, as it has no path to the top. Judging from the lightposts this has to be graveyards of the Wildhammer clan. The picture below shows the decorated graves and the lit candles. I think it’s a very beautiful peaceful little place with a great view over the Krazzworks. If you follow the ramp upwards you get to the second area. I’m not sure what it is, whether it’s a summoning circle or perhaps even a gryphon graveyard, judging from all the feathers. Go there and judge for yourself, and remember to notice the carvings on the tree trunks. If you ever see this little mysterious camel shaped figurine when venturing in Uldum, do pick it up. 95% of the time it will turn into dust, which you can loot and mysteriously sell for 25 gold. But if you’re lucky you will be swirled up in a cyclone, teleporting you to the semi-secret area named The Steaming Pools, located on the border between Silithus and Feralas. I went to The Steaming Pools, which is depicted below and it’s completely devoid of any life, plus it also looks a little underdeveloped, not much going on. Some say you can get there by foot, but I was not able to find any paths leading there. If you get the mysterious teleport there, you’ll see camels walking around not to mention the mysterious owner “Dormus the Camel Hoarder“. He’s an brutal looking elite (with around 225k health points), which you will have to kill. But no worries, most people say he hits like a puppy. The problem is rather finding the rare and small camels and eventually getting one that will actually teleport you. 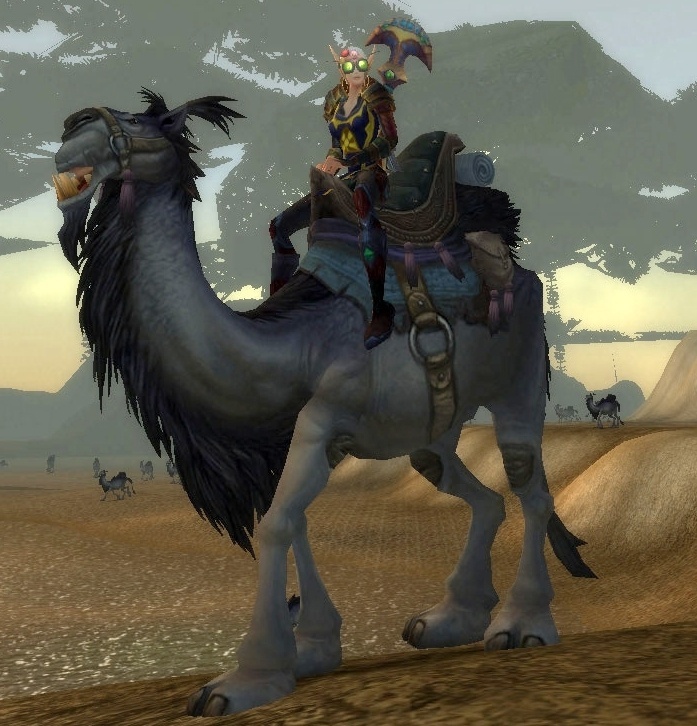 Looting this guy will mysteriously award you the very rare mount Reins of the Grey Riding Camel. Very suitable for riding in the desert, but unfortunately this camel does not fly. I added a spawn map below taken from Wowhead.com. Before the Shattering (aka patch 4.0.3a) Elwynn Falls was a closed off area, hard to get to by normal means of traveling. Instead it was meant as scenery for the flying adventurers, just like the dancing troll village, which however was tranformed into a whole quest hub of it’s own. Elwynn Falls was empty back then, now the owner of the before abandoned house has returned, which you can see with lit windows near the upper left corner of the waterfall. Agee Tyler, the gnome depicted below, sits in front of the fireplace in his empty house. He doesn’t give you any quests and is most likely one of those azerothian hermits. He owns a herd of sheep which graze outside his house peacefully, but if you look closer, one of the sheep does not only appear to be robotic, it also has a name! – “Tekton“. Few people can abstain from killing critters, especially when they’re crowded together. I should warn you though, critter-killers, this sheep is explosive and depending on your position, it might blow you off the edge into a leap of faith. If you survive the explosion, Agee Tyler himself will come out and frown upon your misdeed of killing his sheep. I guess killing critters, like sheep, sometimes has consequences and Tekton and Agee are here to remind you of that, critter-killer! Speaking of critters, Livae noted in the comment about a spot in Mulgore, where critters are at war. I had to see this so I traveled to this location as soon as I was able to, and yes, these critters indeed have their own little zone of destruction. Rumours say they are at killing each other, and I did see what could look like them chasing one another. None of them were dead though, instead the grounds were littered with mice corpses, innocent murdered civilian mice! Secretly I was hoping for critters that were lethal, especially to all of you critter killers out there – but no. They still only have one health point and will die as soon as you carefully poke them with the tip of your pinky. This even goes for the prairie dog to the left wearing armor. When you kill them nothing really happens, except they shrink back to normal critter size and lie there, dead and pretending to be an ordinary critter. So even though we were lucky enough to see critters wielding weaponry, they still haven’t managed to build an army and rebel against our critter-killer guild achievement of murdering 50.000 of them. On the contrary it looks like these critters have an achievement of their own: killing 50.000 mice. Riun wrote in the comments that this is only half the story. At night the mice turn into insane little skull headed, double barrel gun wielding retaliating rodents. At least they keep their own animal populations under control. Lake Dumont, or more accurately the island in the middle of the lake, is the scene of what looks like a diverse group of allies who’s shipwrecked here near a broken mage tower. The location is straight above Dire Maul in Feralas. Livae said in the comments: “It’s like a broken tower with a bunch of random people. I know, best description ever.“, and that is basically it. Some of these NPC’s are just sitting around, one is sleeping, a couple is dancing, a group stands in a circle talking, and of course there’s the grave carrying the name “Ivan”. Unphased and disconnected, life on the island goes on even after you arrive, none of them begs you in a quest to bring them home, nor will they attack any approaching member of the Horde, they are in fact friendly. Often we find stranded people in Azeroth to have lost their minds, as is the case with the Bilgewater goblins at Land’s Ends Beach in Tanaris, but no, these people seem to be hanging out chilling. Rumour has it that all of these NPC’s are named after people in affiliation with Blizzard, and perhaps this place is a sort of memorial. Loads of NPC’s in the Azeroth game world are named from real people and created in honor of them. Blizzard prefers NPC’s over monuments and statues and I think this is also the case here, random as it is. The only NPC’s that don’t have “real names” are the three cats. One of them is quite bigger than the others, and carries the name Rose, as depicted on the picture to the left. I can’t help but feel that this place has to contain something more… but at this point, this seems to be it. I believe this place could have remained unknown for a long time, because this one is definately well disguised. I’m able to add this one also thanks to Livae who unknowingly discovered this place by hiding from the Horde. To go to the hidden goblin club room yourself, you need to travel to the east-end of Thousand Needles. Swim under the Fizzle and Pozzik’s Speedbarge and look for the hole in which the chain to the anchor leads up. To compensate for the clumsy description, the picture below shows where you need to swim up. It’s at the side of the ship and it doesn’t immideatly look as if there’s anything up there. Indeed it does have a goblin pin-up poster, a table with empty cans, fancy pineapple drinks and what looks like chinese takeout… where do you get that in Azeroth? I’d love to know! Should I remind you that this place is underwater. I don’t know when this room was being used, nor do I know what the engineers had in mind when they built the entrance underneath the bottom of the ship – of course it would flood! I think this place is worth a visit, but thanks to the constructors of the Speedbarge, consider underwater breathing. 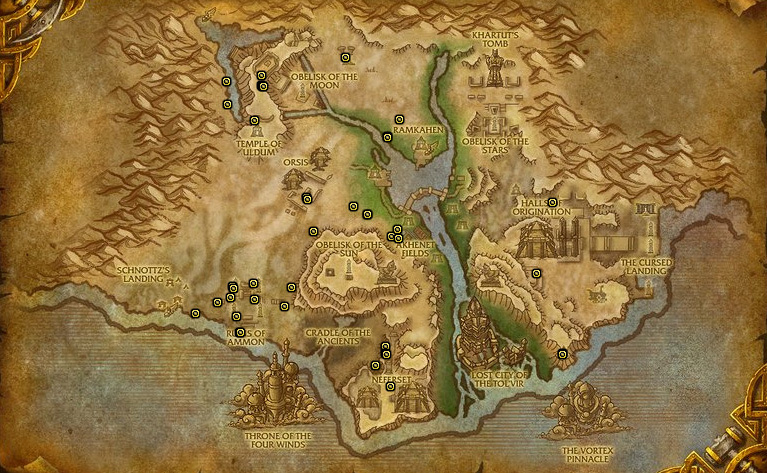 If you look at the map of Tirisfal Glades, you may have noticed the western lake surrounded by mountains, with a tiny island. It doesn’t look like there’s anything there, but as Larsa testified in the comments, this place is not entirely empty. The area, marked with yellow above, stretches out covering what looks like hills on the map, but surprisingly it’s a forest inhabited only by critters when I first went there. 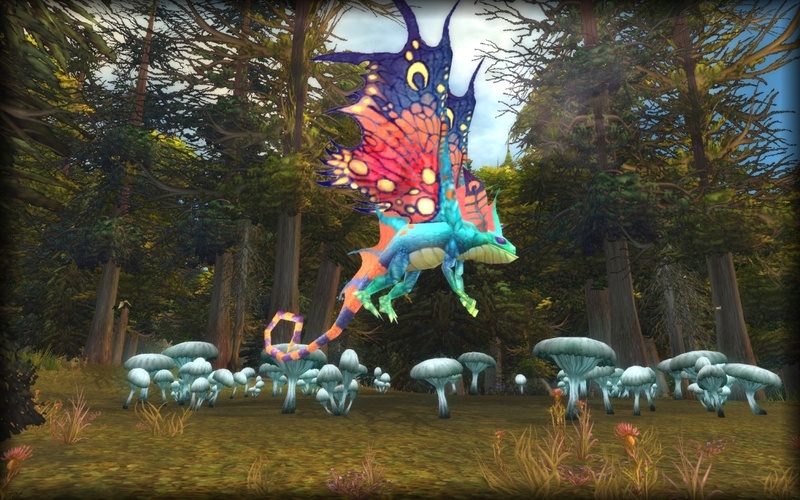 In patch 4.1.0, which came out late April 2011, they added Fey-Drunk Darters, Tirisfal Stags, Does, and Fawns, which we shall see, don’t act like normal animals. When I scouted around, I found a circle of mushrooms on the spot where the arrow is on the map picture up above. Fairy rings are known from real life as well, traditionally thought to be places where one could witness pixies or fairies dancing. Also according to folklore, they are considered dangerous and not safe to go near, and added by the hovering mist above it, the surroundings are rather eerie. 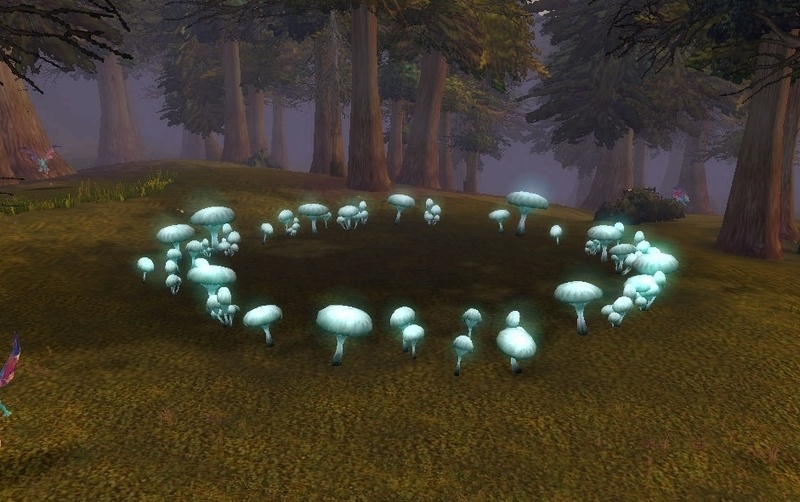 This video is made my Syrco (the author of Syrco Owl, a moonkin blog), who also wrote a detailed description of what happens at the mushroom circle in his post World of Warcraft Secrets: The Whispering Forest, including some really nice screenshots. Tirisfal Glades is said to host an Old God, and I’ve heard rumours speculating that this fairy ring is a sign of this God’s existence. (I’ve written about Old Gods before and ranked them number 4 on my article about The 10 Most Creepy Things in WoW) But judging from the later added darter dance, it doesn’t look like the works of an Old God anymore. In the lake, you’ll see a small island, on which a fishing chair and equipment are situated, and the ground is crawling with rats and littered with fish bones. This is also the scene of a murder! The sceleton lying on the ground, is the body of a fisherman, impaled by a sword while still wielding his fishing pole. If you’re still up for more, continue by swimming slighty east of the island to the bottom of the lake where you’ll find a crashed air plane and the small body of what is probably a gnome. Worthy of notice, the empty tauren hut is not your everyday tauren hut. It features not just the mill and totems as the picture below displays, but also a grand smoking pipe and a strange graveyard connected to the side of the hut. I was asking myself “which kind of person would live here?” and decided to hang around, hoping the mysterious resident would magically spawn and sit behind their pipe for a puff. Then again I wasn’t sure I wanted to know, after all it almost apeared as if this person was collecting especially tauren sceletons but also a sitting troll in a bowl. I know the tauren burial tradition is inspired by real-life native American culture, so the scaffolds are not the strange part, but putting the graveyard in the backyard seems more unusual though. Needless to say, the host never came to greet his uninvited guest. Perhaps my luck in the end! This location is not the only one in Stonetalon Mountains that I would deem hidden, the map underneath shows the two other points, both farther to the north east. As Larsa wrote in the comments, the lakes near the empty smoking tauren hut and the dead hunter are not marked on the map, even though they are both of a reasonable size. The sceleton of the dead hunter sighting is also quite mysterious. Sitting crouched on the little island, clues to his/her death is unknown. The broken boat, the small shed and boxes, tools and a small cage leaves the impression that this was the home of the hunter and perhaps his now buried family. These three wooden grave markings are situated not far from the small shed, and tell the tale of what could be the tragic end of a family. Further towards south-west, in the upper left corner of the map, you’ll find an empty area, except for a small hut and a little further east, some ruins with a few sceletons. These locations are however not as interesting as the above two examples. Just when you think there are no more goodies to find, more pops up and this is a good one indeed. This location was discovered by Skolnick who runs Warcraft Less Traveled, a podcast devoted to exploration, so if you’re in to that, it’s definitely one to keep an eye and ear on. 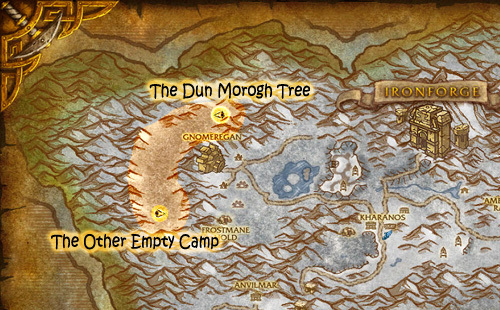 Well, Skolnick found the Dun Morogh Tree by accident as it is listed as an NPC, which is strange for a tree. I suspect he is the first to have noticed this addition that came along the 4.1.0 patch back in April this year. His #54 podcast tells the story of the interesting discovery of this very much amusing location, hidden away in the Northwestern part of Dun Morogh. At the Southern part of this area, you’ll find a small tent with a fireplace and a bit of provisions, however, it’s empty. The same scene can be found at the Northern mark, but here a family of black bears have moved in. But not far from here papa-bear is keeping the previous owners at bay, two dwarven brothers stuck in the NPC “Dun Morogh Tree”, too scared to climb down. Jermaine and Anton Buckey squabble about the pickle they are in, one sitting further up looking rather comfortable (the picture below) and the other holding a branch to defend against the “wee bear” (the picture above). For the sake of the story, I suspect these two dwarves are explorers out tracing this somewhat empty area. Now they provide comedy relief for the rest of us player-explorers – hang in there Buckeys! For more information, a fully detailed description and discovery background behind finding this location, I advise you to listen to the 9 minute long Warcraft Less Traveled #54 podcast. I’m expecting more secrets revealed as Cataclysm unfolds, especially after we’ve seen several new additions being added with patch 4.1.0. I will attempt to update this post when I find more. In Mulgore, Northwest of Thunderbluff on the way to Desolace there’s a little plateau full of critters. These aren’t ordinary critters. There are mice, rabbits, and prairie dogs. And they’re at war! Seriously, these animals are in full war regalia. It looks almost like Rambo. Anyway, check it out! I’ve added them now, thank you so much. I jumped into the whirlpool near STV… and died. Glad to know that the same won’t happen here, because I did indeed think about jumping in, on my way to pick up withers the tree (before we could fly, yeah, I was impatient). I’m horde, so it will be interesting to see what happens to me. Wish me luck! Another cool place is the Gallywix Pleasure Palace in Azshara. Any faction can go (just easier for Horde). It has a swimming pool, jacuzzi, golfing green and a steam room. It just requires a flying mount. As to the Critter Warfare post, it seems that the mice attack the prairie dogs and rabbits. But I’ve seen a few priarie dogs retaliate. South of Tanaris at Land’s End Beach is the wreckage of the survivors of Bilgewater. Just a bunch of crazy goblins running around. But if you’re in the area check it out. Along with the Ruins of Uldum at the Valley of the Watchers. It’s pretty empty but pretty interesting. Directly north of Dire Maul in Feralas is this palce called Lake Dumont. It’s like a broken tower with a bunch of random people. I know, best description ever. Thanks for even more contributions. I added Lake Dumont and the club house, but I visited all the places you mentioned. I found out Land’s End Beach actually has quests connected to the area. The goblin club room was hard to find, even with directions as there’s no hints that there’s anything up there. I think you found a truly hidden spot in that one! Hey… I found this one today. There’s a lake on the west side of the Trisfal Glades map. Fly up to the lake and you’ll see a small island in the middle. There’s an umbrella and a skeleton with a sword through his chest. Swim to the bottom of the same lake and you can find a sunken Gnomish plane with accompanying skeleton. I added them all under a combined headline “The Fairy Circle and the two Sceletons”. Thanks for your contribution! It’s at the top of the cliff just behind Nighthaven. I don’t think this was accessible pre 4.0.3. Also, you could mention some of the places that existed pre Cataclysm that are still there now. Like Newman’s Landing and Cave of the Bengal Tiger. There’s also the cave on the south shore of what is now Ahn’Qiraj (where there also used to be an abandoned Tauren Village). It actually includes the Tauren Village, which sadly is gone now. The tunnel still stands though. Found another. Start in Ashenvale at Silverwing Refuge. Fly straight south over the moutains. First you’ll come to a lake that’s not marked on the map. Nothing special here save a small canoe. Fly south a bit more over the larger mountain (or just fly around it) and you’ll find a Tauren hut – with a gigantic smoking pipe?! Now creepier here, behind the hut are what look like a bunch of Tauren sarcophagi and a some barrels filled with bones! There’s also a couple mummified Trolls. Might want to add an 11 to your creepiest things list. Go to Cragpool Lake in Stonetalon Mountains. Take a look at the large water wheel and fly over the mountain above it. You’ll find another unmapped lake with a small island in the middle. There’s a hunter’s skeleton with a few items laying around. Off the side of the lake is what appears to have been the hunter’s home. There’s also some ruins of an old structure found beneath the waters. Not sure if these are fly over areas or not. Can anyone confirm? I was able to fly there and updated the post with your findings. I also found some more in Stonetalon in the upper left corner, but they are not as exciting as the ones you found – so thanks again. The area you found in the upper left corner existed before the Cataclysm. That was definitely a flight path fly over zone. I was able to get to that area pre-Cataclysm as well. There were some pretty cool incomplete areas there previously, and that lake in the upper left corner used to have a closed off partially submerged cave. High Admiral “Shelly” Jorrik is a secret goblin merchant, he doesnt sell anything good but hes pretty tricky to find anyhow. Link from wowhead to help u find Him and his shack. I was flying around the southern Feralas/Silithus border, right under the E and N of Isilden of Ruins of Isilden. Just a little west of The Steam Pools. Theres a little hunter camp, with cages, tents, fancy looking pillows. Also, the tents seem to match the ones Gnolls can be found around, with nothing more than human faces etched into the insides :O As stated in your 10 Creepiest things in WoW article. Theres also a few torches that seem to mark the path leading from the camp. Also another camp in the same area, with a shack, bear pelt, and campfire. Location is near Frayfeather Highlands, just to the west of The Ruins of Isilden. Book, lamp, and mug inside the shack, a knife in the front wall of the shack also, with another in the top of the nearby log. Nothing major, but a little fun to find things like these. There is a world of Warcraft podcast that has shows all about rarely seen or lesser known areas in Azeroth. The show is called Warcraft Less Traveled and I think the audio archives are on the WarcraftLessTraveled.com website. These kind of hidden easter eggs in the game makes the experience so much fun. Hope this helps. Ok hi, there’s a spot you missed, where that plane crashed in the mysterious lake at Tirisfal Galdes. Just north of that crashed plane there’s a skeleton with a ball and chain on the bottom of the lake. He sits next to a log. Dont know if you touched up on this either, its been there since vanilla, a place called Newman’s Landing. Great site!! I couldn’t find this sceleton at first, it is very small, and yes it is chained like a prisoner, quite spooky. Just read Critters at War in Mulgore and I know why the rabbits and prairie dogs are killing the mice. At night the mice turn into mutant creatures that have double barrel shot guns for arms ( Its very hard not to kill these critters ) and preceded to slaughter the rabbits an prairie dogs. Brilliant! This would explain a lot, I’ll have to go and check this out now…or tonight in fact. You forgot the hidden cave in Mulgore. Take the zepplin from Org to TB (NOT the other way around) and when you get to the highest point in the mountains between the Barrens and Mulgore (pre-cata it was right aftre the current area was Honor’s Stand, not sure about now) jump. follow the steps towards Mulgore and yu’ll eventually see a cave to your left. Nothing in it, just cool. If anyone remembers the AQ opening questline, part of it made you go to islands south of Tanaris. either use a flyer or epic ground and a water walk. Some mobs are there, but only normal level Tanaris mobs. Also, look at the map of Tanaris. Now look at the center of the compass. Right there is a small underwater goblin town, hard to get to, to say the least. Finally, in the corner of the map near Silithus (Swim around from Tanaris) is a large tauren hut with a cool looking windmill. A few of the locations you mentioned have actually been removed: https://ironyca.wordpress.com/2010/11/18/4-secret-locations-to-visit-before-they-dissapear-with-cataclysm/. That is the South Seas Islands (the islands below Tanaris) and the coastal tauren farm (At the south shore of Silithus). I know about the underwater goblin city, but it was added before Cataclysm, and doesn’t really qualify as a specific Cataclysm location. There’s definitely a lot of hidden areas out there, but I wanted to collect the Cataclysm ones here, which is why this list is far from complete. apparently in mulgore the place with all the rabbits and prairie dogs does have weapon weilding mice. they have human skulls for hats and what looks like a double-barreled shot gun in each hand. i guess they take turns killing eachother. Thanks for reminding me, the post has now been updated. Ironyca, I went this morning to go see the faerie circle song in Tirisfal glades from a recommendation from a guildie and afterwards I was researching and came across your post. I have put a link to this page in my Whispering Forest page – this post about secret places was amazing! I am going to go and explore all those places now! 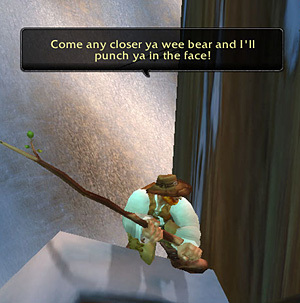 if you did the quests in Hillsbrad, Johnny Awesome! Although I can’t remember if there is any vendors, there isn’t any quests, and there is even several types of level 80-85 crabs, oil sludges and vultures. I remember having a run-in with one of the birds on my 74 rogue trying to fly to Silithus to mine. Haha, this sounds crazy, saw it on Warcraft Less Traveled. I think I’ll have to do a version 2, stuff keeps coming in, thanks for notifying me! I remember where it is now! It’s not near the steaming pools, it’s on the opposite end of Feralas, in the mountains between the Ruins of Illisden and the Writhing Deep. About halfway out into the lake from the island, to the north, is an empty rowboat. If you peek inside there’s a skeleton, a pack of supplies, two skulls and a sword. Diving straight down into the lake from this location reveals a big pile of skulls on the bottom of the lake, leaking air bubbles! Very cool, and kind of creepy. I’m not sure what the implication here is, unless the (rumored to be Blizzard employees?) stranded NPCs are relaxed because they have had a steady stream of food….? Eek! When I went to The Steam Pools I found a resort. >.> I just went flying there and yeah. It looks like a goblin run resort. Also, looking at the map for Feralas, on the upper right there are two lakes that are just above the the start of Thousand Needles. The one closest to Thousand Needles has a canoe, totem pole, empty Tauren hut, and a log seat with some weapons and what looks like a backPack on it. I found an underwater area west of Stormwind Harbor. I was disconnected but still able to fly over there. First, I swam under an invisible force field, then I kept fly until I hit the blue force field. Then, I swam down and I could see these enormous pillars, Giant skeletons, and a bunch of floating yellow glowing spheres. I was able to reach this place by simply swimming under the force field that separates Stormwind from Vash’Jir. Don’t stop flying until you hit the very edge. Keep flying west of Stormwind. I had two world of warcrafts windows open. I forgot about the other, so I accidently disconnected it. I was on my flying mount at the time, which is why I decided to explore Azeroth. I was recording a video but never finished it due to my laptop mouse clicking the exit button. I have a video of some of it though. I have my email attached to this, so if you want info, just reply to this. Thanks for your comment. I suspect your discovery was a sort of glitch, which could make it harder for others to go explore for themselves. I try and stick to the stuff that are mostly not “accidental” but put in there for players to discover, if you know what I mean. That sounds awesome! If it was more than just a glitch I would love to know! Email me if you want! also in ravenholdt manner in the cellar is what looks to be a dragon egg busted open with a lamp on it.. incubator? Hmm, is she lying down on her side and the picture is a little blurry, as to resemble paint? There’s a little place in Teldrassil, just outside of Darnassus that I love. It’s kind of tricky to find, but if you head north off the road, right around the bridge, you’ll see a semi-hidden path on your minimap, and if you get to it, it takes you to a small empty cave. Not overly exciting, and it’s been there for quite a while, but I love it! There is a little dwarf camp between Dun Morogh and The Searing Gorge, dunno if any1 has found this yet. Couldnt find any documenation of it. If you go to the far side of aszara and go north along the ocean in east winter spring there will be a dead turtle underwater and a small village with 2 hut/towers a pile of skulls 3 small skulls a bunch o meat and 2 fish. Also if you fly along the north part of dark shore you will come across what looks like a grave/alter. just look for a big indent in the landscaping near the kinda dead trees. 1) A lake behind Darnassus. Apparently only accessible by flying, but I’m trying to find a way by ground right now. I’ll see how that works out. 2) Behind the Silvermoon walls on the north side, you have to do a bit of wall jumping to get there, not a lot though. Mostly walking from the west side of Silvermoon. It’s just empty except for a few trees, but it gives a nice view of Azurebreeze Coast. 3)Speaking of Azurebreeze Coast, there’s a little thing underwater on the south-east side of Azurebreeze Coast. It’s very pretty, it’s got seaweed, kelp, colorful rocks, clams, etc. 4) Cut-throat Alley in Stormwind. Go into the Shady Lady, which is around the Canals of the Dwarven District. There’s a small lane behind it which is Cut-throat Alley and it’s empty, but a nice spot for RP. 5) There’s a little camp on the mountains of Ironforge Airfield. Two empty tents, a campfire, some boxes and a nice view. 6) Empty camp in Westfall, in the very southern end near the Deadmines. 7) A cottage and an apple farm in Westfall, it’s in the mountains. Accessible by flying and by ground. 8) There’s an empty, forest sorta spot in Stormwind. Go to the Old Barracks, aka the Park. There’s a little break between the wall and there’s grass rather than burnt ground, but it’s a bit high above. You can get to it by flying or by a well timed jump with a ground mount, and then by finding that certain hill and walking on it til ya get there. 9) There’s a small house on the outside edge of Dun Morogh, right at the edge of burnt ground and grass. It’s a house that seems to have been touched by the plague, it’s dark and has bones in it. But it’s still a nice place to visit. Sorta. 10) I once found a way to get to Desolace by the mountains in Mulgore. I don’t remember which mountains I took but I remember I just went west of Thunder Bluff and somewhere along the mountains, there was this pretty cool burning tree I found. Update: The lake behind Darnassus IS inaccessible by ground. But, while trying to get there I find a small little place in the mountains around the lake. I don’t really know how to describe how to get here though… It’s pretty plain though, but it’s a sorta cool little spot I guess. This entry was posted on December 23, 2010 by Ironyca in Exploration Finds, Most Popular Posts, Opinion and Discussion and tagged achievements, Cataclysm, Exploration, Hidden places, World of Warcraft.